Biotinylated Human ITGA4 & ITGB1 Heterodimer Protein (IT1-H82W1) is expressed from human 293 cells (HEK293). It contains AA Tyr 34 - Thr 977 (ITGA4) & Gln 21 - Asp 728 (ITGB1) (Accession # P13612-1 (ITGA4) & P05556-1 (ITGB1)). 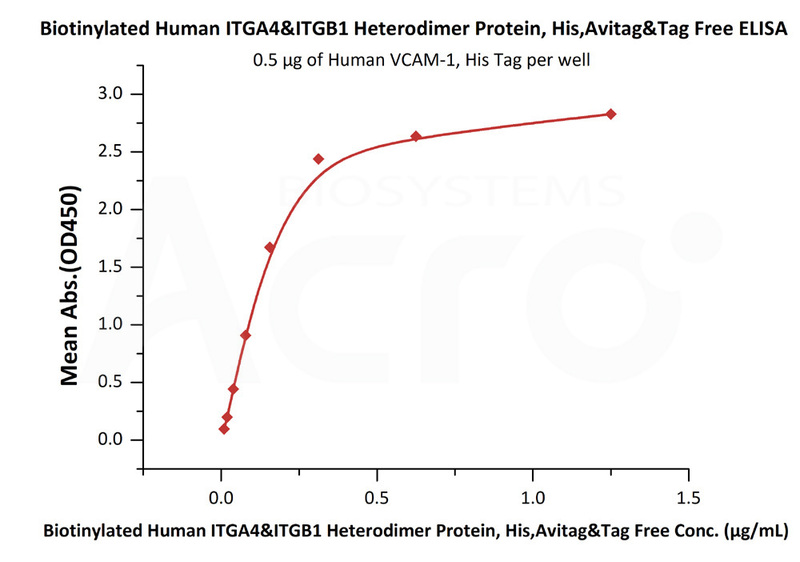 Biotinylated Human ITGA4 & ITGB1 Heterodimer Protein, produced by co-expression of ITGA4 and ITGB1, has a calculated MW of 113.2 kDa (ITGA4) & 83.7 kDa (ITGB1). Subunit ITGA4 is fused with an acidic tail at the C-terminus and followed by a polyhistidine tag and an Avi tag (Avitag™) and subunit ITGB1 contains no tag but a basic tail at the C-terminus.The reducing (R) protein migrates as 100-150 kDa (ITGA4) and 65-85 kDa (ITGB1) respectively due to glycosylation. 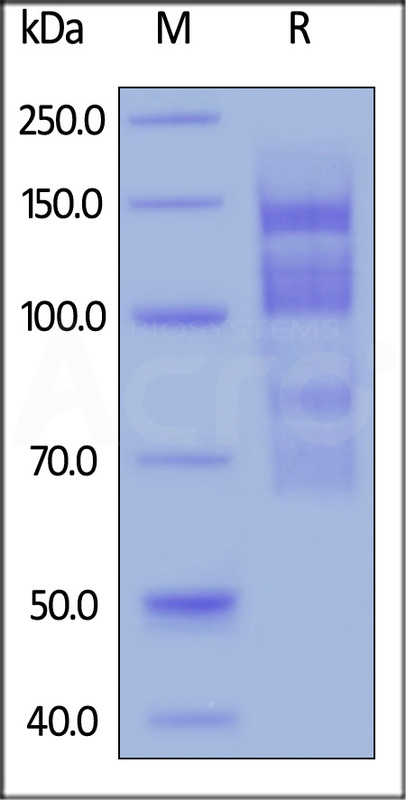 Biotinylated Human ITGA4 & ITGB1 Heterodimer Protein on SDS-PAGE under reducing (R) condition. The gel was stained overnight with Coomassie Blue. The purity of the protein is greater than 95%. 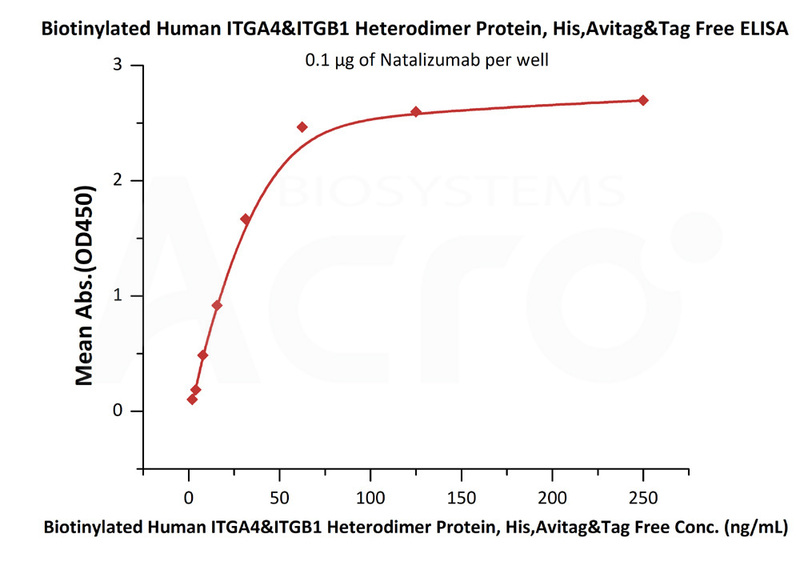 Immobilized Natalizumab at 1 μg/mL (100 μL/well) can bind Biotinylated Human ITGA4 & ITGB1 Heterodimer Protein (Cat. No. IT1-H82W1) with a linear range of 2-31 ng/mL (QC tested). Immobilized Human VCAM-1, His Tag (Cat. No. VC1-H5224) at 5 μg/mL (100 μL/well) can bind Biotinylated Human ITGA4 & ITGB1 Heterodimer Protein (Cat. No. IT1-H82W1) with a linear range of 0.01-0.156 μg/mL (Routinely tested). Integrins are transmembrane proteins that mediate interactions between adhesion molecules on adjacent cells and/or the extracellular matrix (ECM). Integrins have diverse roles in several biological processes including cell migration during development and wound healing, cell differentiation, and apoptosis. Their activities can also regulate the metastatic and invasive potential of tumor cells. Integrin alpha 4 beta 1(Alpha-4/beta-1) is receptors for fibronectin. Integrin alpha-4/beta-1 is a receptor for VCAM1 and recognizes the sequence Q-I-D-S in VCAM1. (1) May AE., et al.2000, Blood., 96(2), 506-13. (2) Luo BH., et al.2007, Annu Rev Immunol., 25, 619-47. (3) akada, Y., et al. 2007 Genome Biol., 8(5), 215.